These Sriracha Seared Salmon Cakes are spicy, crispy, and satisfying. Baked or fried, these are, without exaggeration, the best fish cakes I have ever made or eaten. It’s not a claim I make lightly. Trust. 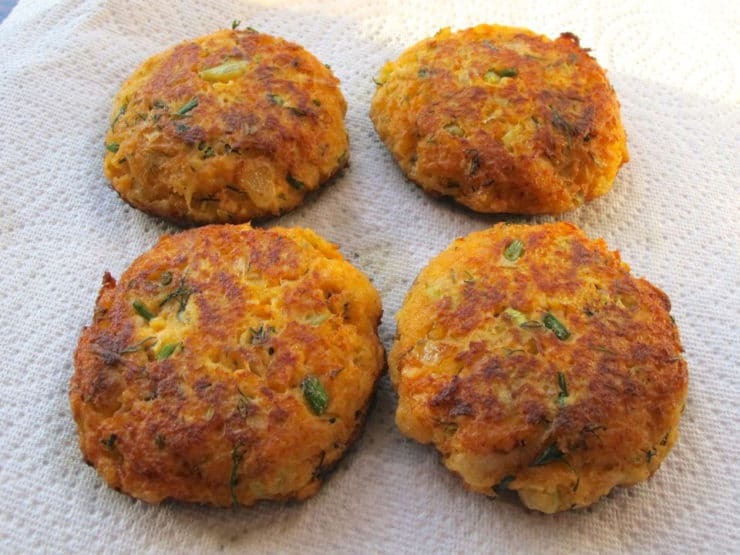 I have tried many salmon cake recipes over the years; most were lacking spice, overly-complicated, or just plain boring. In my own version, I start with my oven seared salmon as a base. Searing the salmon takes all of ten minutes, and it is SO worth the extra effort. Using fresh seared salmon rather than canned will give you a fresher, less “fishy” flavor as a base. It will also give you some glorious crispy browned edges, which add a ton of flavor to the finished product. When you start with freshly seared salmon, you don’t need to “doll it up” too much. 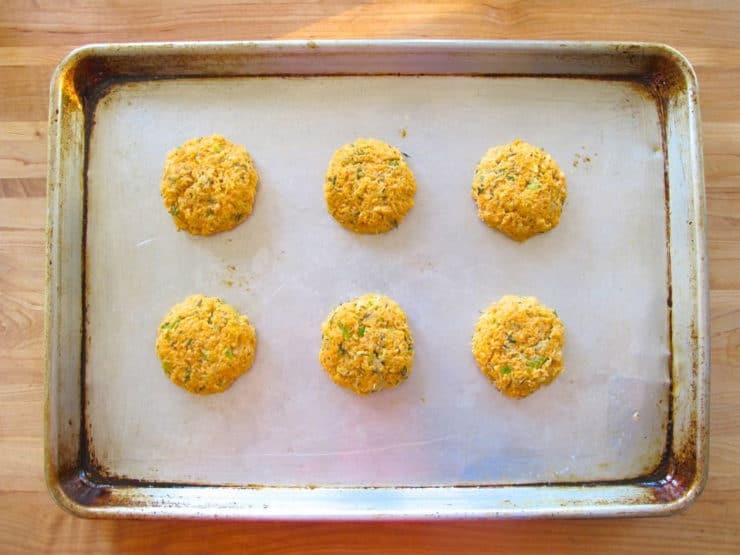 I tried lots of variations, but found that a simple mix of celery, onion, Greek yogurt, panko, dill and smoked paprika gave these salmon cakes all the flavor and moisture they needed. Oh, and Sriracha. Did I mention Sriracha? Yeah. Adding Huy Fong’s magical spice sauce was a total goldmine! Most people don’t know the history of sriracha. The Huy Fong brand was developed in 1980 by a Vietnamese refugee of Chinese descent named David Tran. The name, Huy Fong, comes from the ship Huey Fong that brought Tran to America. Sriracha sauce itself was inspired by traditional Thai hot sauces. Not surprisingly, 80 percent of the recipe is chili peppers, aged in the bottle for 6 months before being sold. The thick, garlicky hot sauce is bottled in Southern California, not far from where I live. 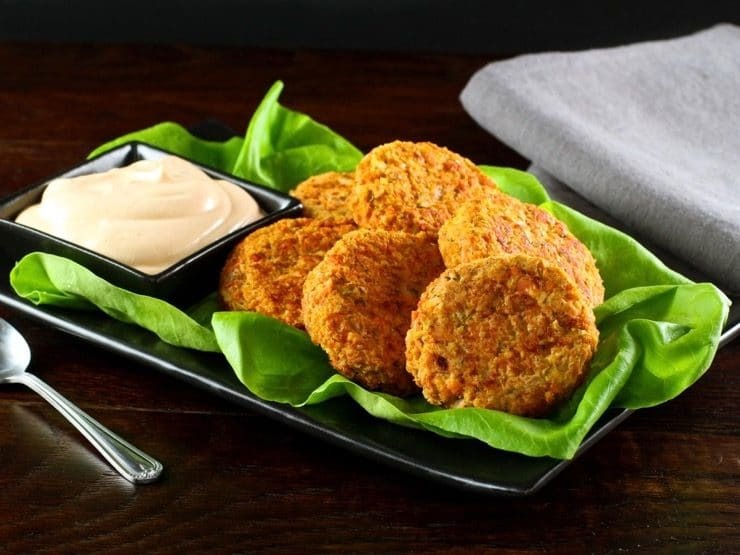 WhenSriracha is added to these seared salmon cakes, they go from tasty to extraordinary. Top them with a dollop of cream Sriracha sauce, and enjoy! Spicy, delicious salmon cake recipe with herbs, Greek yogurt and Sriracha. 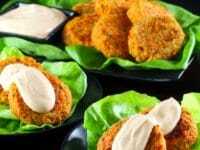 Baked or fried, healthy and delicious. You will also need: Large nonstick skillet with metal oven-safe handle, food processor, mixing bowls. Serving Size: 1 salmon cake (appetizer portion). Recipe makes 10 cakes total. Preheat oven to 425 degrees F. First you will need to sear the salmon. For step-by-step photos of the following process, click here. Place a large nonstick skillet with metal oven-safe handle on a burner over medium high heat for 3-4 minutes until drops of water sizzle and bead on the surface when you sprinkle them. When water dries pour 2 tbsp oil and swirl around the bottom of the pan to evenly coat. Oil will begin to smoke lightly after a moment or two. Place salmon fillet(s) gently into the skillet. Turn the heat to high. Let the salmon sear for 2-3 minutes until a golden brown crust begins to form on the bottom of the fish. You'll be able to see the edge of the crust where the meat touches the pan. Transfer the whole skillet to the preheated oven. Let the salmon continue roasting in the oven for another 6-9 minutes until just cooked through. Using an oven mitt, take the hot skillet out of the oven and remove seared salmon from the skillet. Leave the remaining oil from cooking the fish in the skillet, you'll be using it again. Roughly chop the salmon and reserve (it will be about 1 1/2 cups flaked salmon). If baking the salmon cakes (recommended), reduce oven heat to 375 degrees F. If frying the patties, you can turn the oven off. 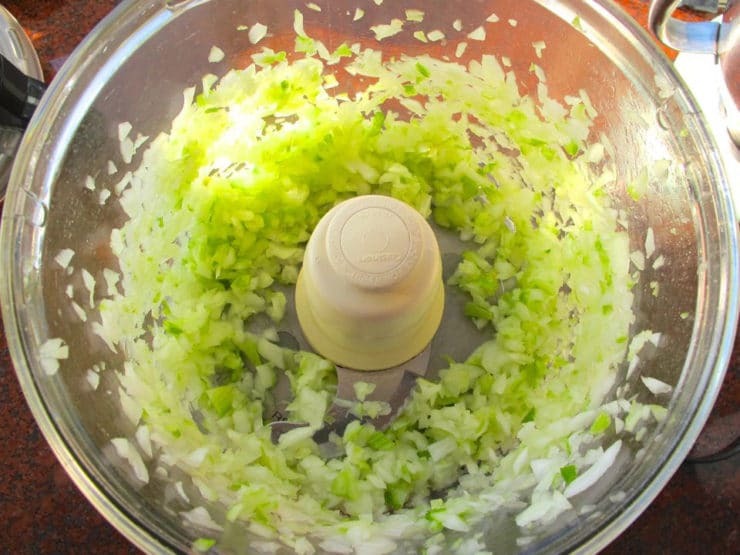 In a food processor, mince together the celery and onion. 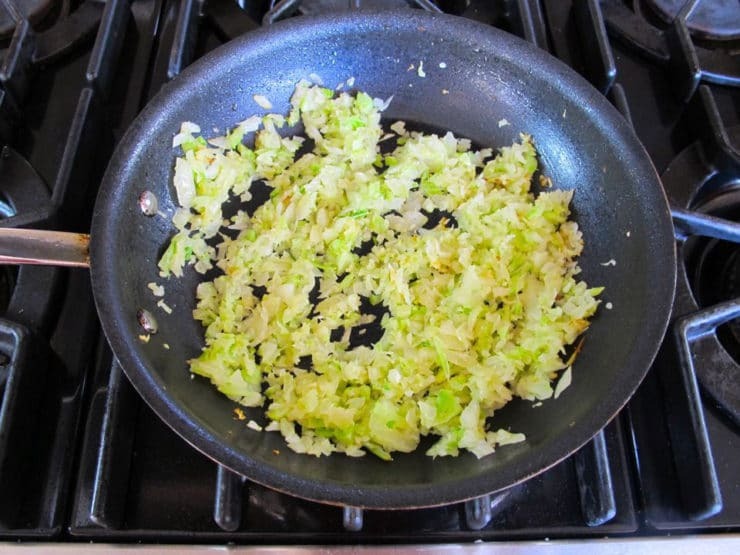 Add the minced celery and onion to the same skillet you used to sear the salmon. Cook until softened and starting to caramelize. Place in a mixing bowl and allow to cool off. In the mixing bowl with the cooked celery and onion, add the processed salmon and dill, 2 beaten eggs, Greek yogurt, salt, smoked paprika and sriracha. Stir to blend, then add the panko breadcrumbs. I recommend baking these fish cakes. There is really not a big flavor difference here between baking and frying, and baking lowers the calorie count. To bake them, shape the mixture into 1/4 cup patties, then place patties on a well greased baking sheet. Place in the preheated oven and bake for 8 minutes. Turn the patties, then bake for 7-8 more minutes till browned and cooked through. If frying the patties, add enough oil to the skillet to reach a depth of 1/4 inch. Heat slowly over medium heat. 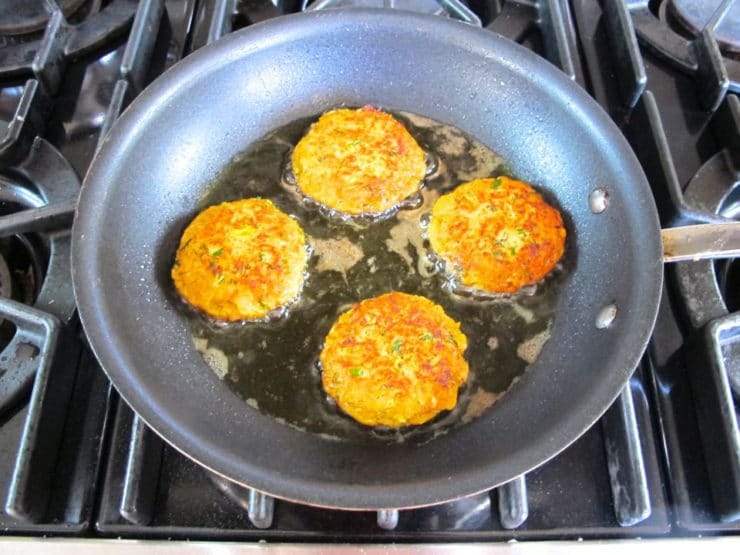 When the oil is hot, fry the salmon cakes for 2 1/2-3 1/2 minutes on each side till golden brown. Be careful not to overcrowd the pan. Once cooked, remove the salmon cakes from the pan using a metal spatula and place them on paper towels to drain. 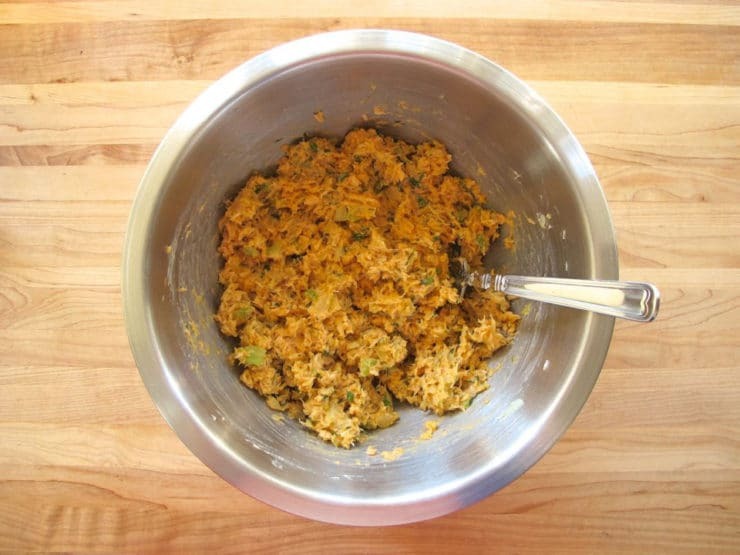 To make the sauce: Combine ingredients in a mixing bowl and stir together until well blended. 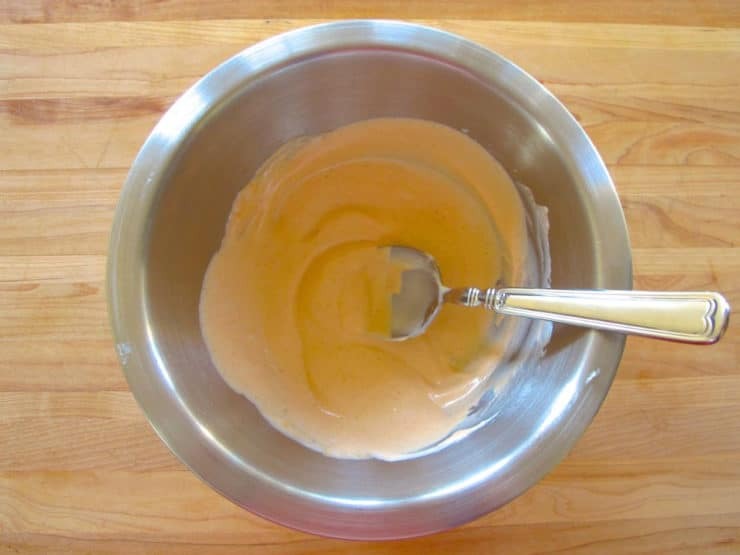 If subbing Greek yogurt or sour cream for mayonnaise, add salt to the sauce to taste. Add additional sriracha for added spice, if desired. 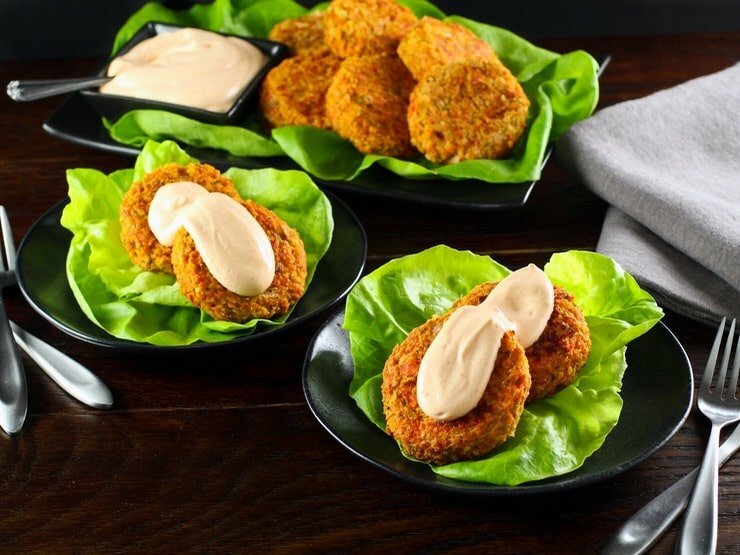 Serve salmon cakes topped with the creamy sriracha sauce. Hi was wondering if I can used canned salmon instead of fresh? I LOVE LOVE LOVE your website!! 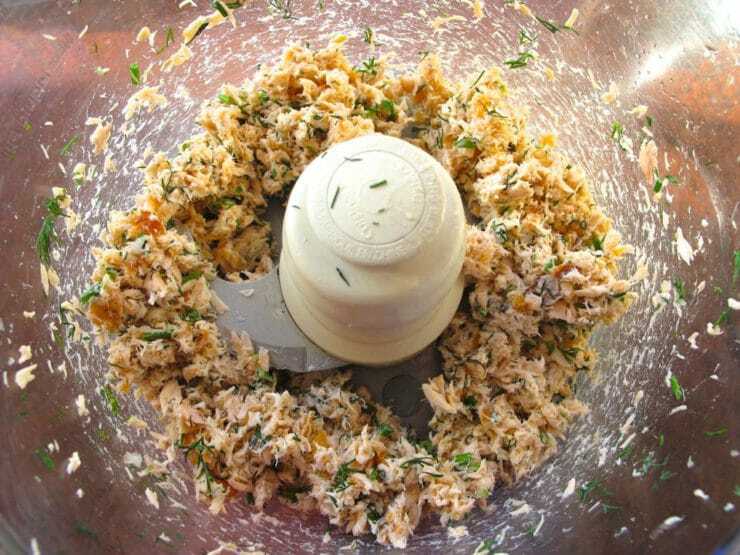 Has anyone tried using packaged lump crab? It should work just fine Tracy. 🙂 Glad you’re enjoying the site! 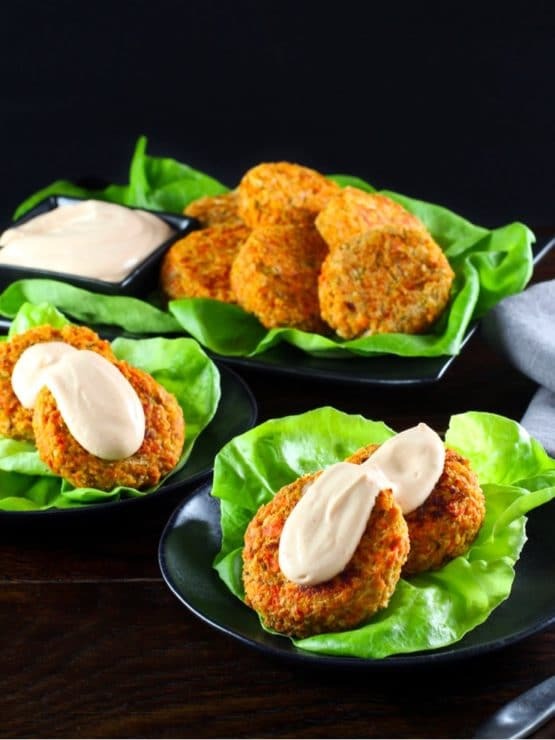 I have to admit that I almost gave up on fish cakes because I haven’t made or tried any cakes (except crab cakes with real crab meat which is not an every day meal) which I would want to make or eat again. 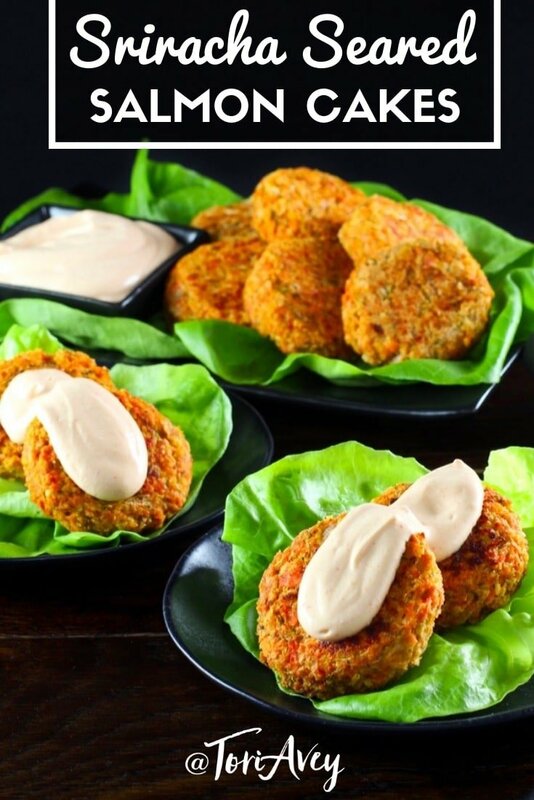 These salmon cakes are absolutely fabulous! I have followed your recipe precisely and they came out delicious. The sauce idea is fantastic as well. I am not new to cooking and spices but I didn’t know about sriracha sauce. It’s a true discovery I must say. I also tried to substitute panko bread crumbs before I found where to get them with grated sweet potato and a little bit of quinoa flour and psylllium husks for holding the mixture together – and it also worked well and was tasty. 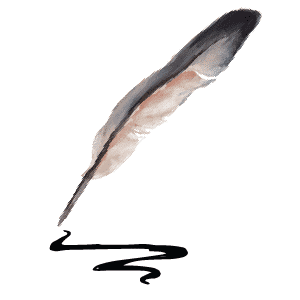 I rarely write comments but this time I decided to write the words of appreciation for the detailed explanation, history insights and gratitude for sharing your recipes and their sources. Your cooking blog and recipes are the only case in my cooking by the book experiences so far that I find everything I make from here comes out tasty and more or less expected consistency and flavour. This is very hard to achieve due to the difference in the quality of the produce across the world. I am not in the US or Israel but in Eastern Europe and I find that your recommended proportions and combinations work very well with local produce as well. I made several dishes (mostly from “healthy” section) and I am very impressed with the results. Thank you so much for your very kind comment Nicole! I am upgrading the recipes site-wide to a new system that supports metric measurements, so that should be helpful for you. So happy you are enjoying the site! 1. What type of Greek yogurt works best? Fat content and brand (given sourness profile). 2. We’ve got some amazing sweet corn that I want to grill and scrape off the cob and add to it. Will that work OK or will the flavors fight. Hi Kelly, Tori’s assistant Ashley here. We normally use full fat Fage Greek Yogurt. I’m not sure about the corn since we haven’t made these with corn added. I think that flavor-wise it sounds lovely, but not sure how the cakes would hold up. I was thinking about freezing some for a quick dinner, whats your thought? Tried it anyone? This recipe has become part of my regular rotation ever since I fixed it for Rosh Hashanah! I love the addition of sriracha and how making salmon cakes can really stretch out a piece of salmon. I made these earlier this week…..they are AMAZING!! Excellent recipe! I made this tonight and it was a tremendous success. Used flax seed meal soaked in water in place of eggs, but followed the recipe otherwise as written. Served over lemon-dressed baby spinach with a scoop of quinoa and some baby tomatoes and goat cheese tossed over the top. Delicious. Thanks a million for this recipe! You’re welcome Dawn, glad you enjoyed it! I made this recipe today for a Rosh Hashanah brunch, and everyone loved it! I wavered between wanting it to have a higher percentage of salmon and appreciating that it stretched a half pound of salmon into a meal for four people, but the overall flavor was fantastic. 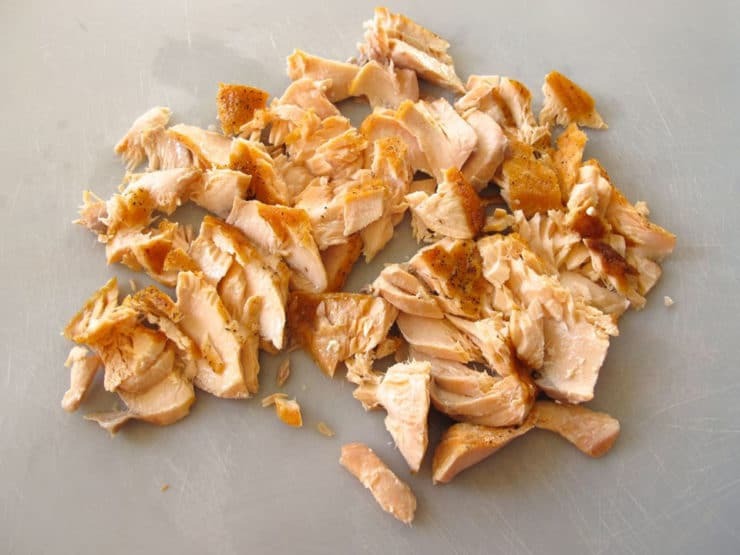 Can you actually get 10 salmon cakes out of a 1/2 pound of salmon. Jackie yes, if you follow the directions as written. I’ve made this recipe several times and always end up with 10 cakes using 1/4 cup of mixture each. They’re not big cakes (not burger sized), just average sized fish cakes. Remember, there are lots of other ingredients in there too besides the salmon! Will these freeze well and taste good afterwards? Hi Rivka, I have never frozen these. I assume they will probably freeze and reheat well, but with fish dishes I feel that freshly cooked is always best. Sounds and looks delicious. How do you think they’d turn out if grilled? Hi Maurice– the patties are very soft when they are formed, so I’m not sure they would hold up on a grill… they’re pretty delicate. Thanks Tori you hit it out the ball park with this! I just found gluten-free Panko breadcrumbs at the store. This looks like a great recipe to try out with them! Thanks for another tasty recipe that incorporates visual and taste appeal altogether in one! Multiple fish-gasm. Everything is better with a little Sriracha. Asian hot chilli sauce: chilli paste, vinegar, garlic, sugar salt. Can get in any Asian super or online. sriracha……What is that? And where do you buy it??? what is sriracha?? where can i find it in NJ- or what ingredients can i use to make it? Hi Marcia– it’s a spicy pepper sauce. Nowadays it can be found in the Asian section of most grocery stores, it is quite popular. I would love to try this. What would you substitute for the Greek yogurt in the fish cake recipe? Dorine I would not use coconut milk here, the flavor would not be right and it’s too liquid– you need something thick and creamy for the proper texture. Sarah what kind of a sub are you looking for? If dairy is ok, use sour cream as a sub. If dairy is not, use non-dairy sour cream (like Tofutti sour cream). I have used coconut milk yogurt for dairy-free cooking. It’s thick like yogurt. Might try it. That answers the question: What’s for Dinner? Thank you Tori Avey! I’m way behind the curve here….I’ve never tried Sriracha…I even meant to get some last time at the grocery. …but …I have at least a half dozen red sauces I like already…mostly I like Tapatio, Louisiana Hot Sauce, and Cholula…but then again, I’m in North East Texas….but thanks for another reminder about the famous Sriracha, which I’ve yet to try. This is the salmon cake recipe I’ve been searching for! That looks delish! I think Father’s Day Dinner has been decided! These look great! You recommend baking…I have to ask: Do you recommend baking for health reasons or because you think that the baked ones taste better than the fried?